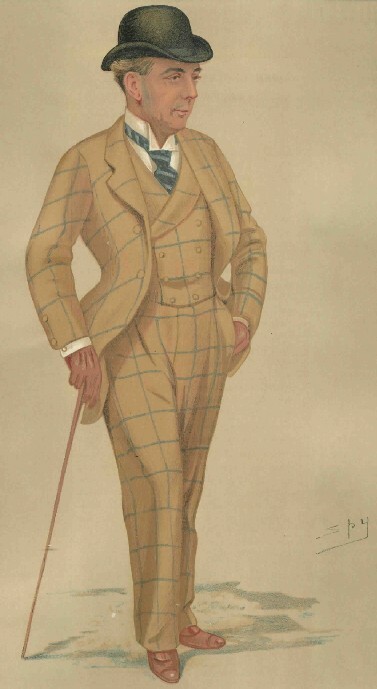 This nattily attired gentleman, Mr. Hwfa Williams, is the manager of the horse racing course Sandown Park and he was captured in this lithograph by Sir Leslie Ward for Vanity Fair in 1891. For when some seventeen years ago a band of gentlemen interested themselves in the provision of a race course to be conducted on superiour lines near London, and found it in Sandown Park, they also found in him a manager after the sportsman's own heart, who there invented that system of gate money racing under 'Club' auspices which has since been so generally adopted. He has surmounted many difficulties, well established his own reputation, and raised Sandown Park to, and maintained it in, the position of the best managed race course in a country in all part of which its methods have been imitated. A print of a jockey who raced in the park is available here. This print comes already matted to a standard 16 x 20" frame size so it will be easy and inexpensive to frame and is enclosed in a protective plastic sleeve.